The St. Ann School Pre-K Programs provide activities and experiences that will make your child feel secure, confident and loved. The curriculum combines teacher and child guided thematic activities through both group and individual instruction. Children are provided with daily opportunities to explore and grow in the areas of religion, language and mathematics as well as in cognitive, social, motor and self-help skills. Children who attend our Pre-K Program grow through self-discovery and independence in a loving Catholic environment. 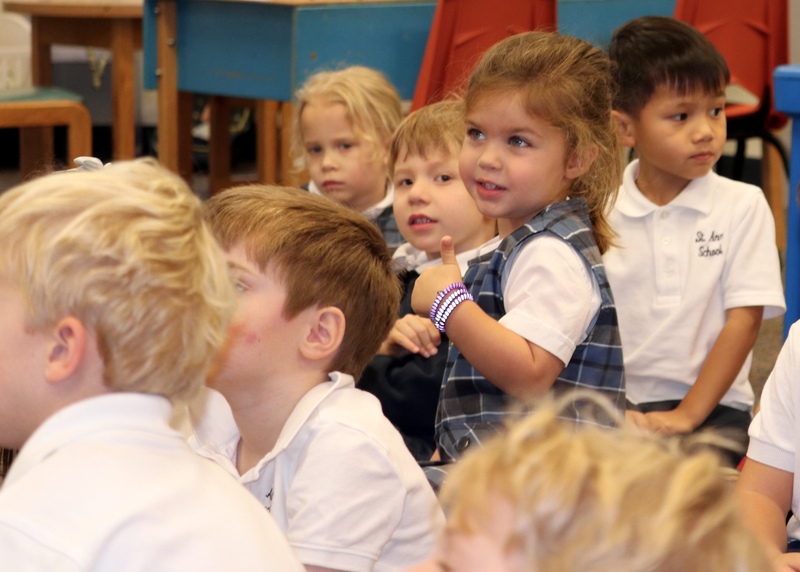 The program aims to prepare your child for the future years at St. Ann School academically, while also fully embracing the power of play for young children. Schedule your visit today by contacting us at 302.652.6567 or by emailing Admissions at esheetz@thesaintannschool.org. Tours are also available in the evening by appointment. Our program focuses on guiding your child through early development of his/her spiritual, intellectual, language, physical, social, and self-help potentialities. Your child will grow in awareness, self-discovery and independence in a loving Catholic environment. We will provide experiences that will make your child feel secure, confident, and loved, with a strong sense of self and the ability to be creative in work and play. Religion - Bible stories and Christian Values are the major focus of this special time, every morning. Each month has a special religious theme. Activity Time - Children learn to make choices and choose their areas of play each day. Activities such as puzzles, Legos, blocks, bead stringing, housekeeping, dollhouse, books, train table, art materials, and dramatic play are available to help develop small motor coordination and stimulate cooperative play. Reading/Language - Various language experiences with finger plays, songs, and stories are enjoyed each day. Phonetic sounds, letter recognition, application of letter sounds, sight words, and vocabulary are introduced the second half of the year. Math - Introduction to number quantity, cardinal numbers recognition, ordinal numbers, patterns, geometric shapes, sequencing, graphing, and spatial relationships are all presented. The calendar, days of the week, months of the year, birthdays, and holidays are a part of the daily math meeting which help develop memorization skills. Motor Skills - Fine motor activities as well as eye hand coordination skills will begin and gradually increase with difficulty. Activities with paper crafts, paint, clay, play dough, scissors, and worksheets are incorporated with the theme of the month. Science/Social Studies - Science and Social Studies topics are incorporated into the curriculum with each theme of the month. The five senses are explored in the area of Science and the home and community are covered in Social Studies. In addition, the children participate in weekly physical education, music, Spanish, and library classes. They attend school Masses each month with their prayer buddies. They perform in the Christmas and Spring Concerts. Educational field trips are offered in house. A five (5) day a week program from 8:00am to 2:45pm. Children applying to the Pre-K 3 program must turn 3 by August 31, 2019 and be fully potty trained. Children applying to the Pre-K 4 program must turn 4 by August 31, 2019. Before Care and After Care services are available at an additional cost. The tuition rate is the same for both parishioners and non-parishioners. No financial assistance or multiple children discounts will be available.